Happy All Saint’s Day to you all. This month’s JSF are brought to you courtesy of Bubbles, who said in her letter “I can’t believe you haven’t done coconut Pocky!! 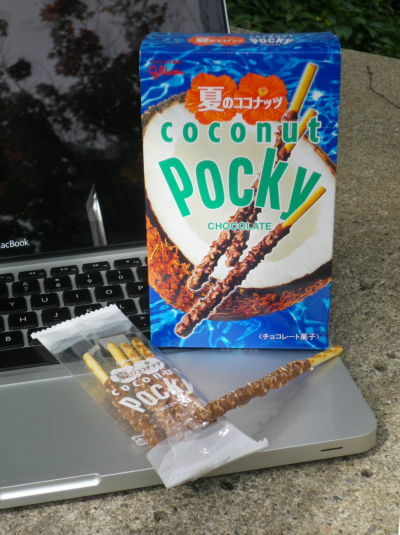 So I sent some along.” This was very strange to me because I remember doing coconut Pocky quite a while back. But just like Bubbles I could not find it on the JSFR. Then I thought maybe I reviewed coconut Pepero but I did not find that either. I began to think maybe I had an out of reviewer experience and perhaps I was sharing head space with Pocky Watch who fairly recently reviewed these. However, I swear I remember comparing coconut Pocky to a Russell Stover coconut cup and that just didn’t seem like Pocky Watch’s style. In fact, it seemed very much my style and I also clearly remember eating coconut Pocky but no matter how you look for it, coconut Pocky doesn’t exist on the JSFR. Then, more recently than I care to admit, I had a thought and that thought was perhaps I did review coconut Pocky but it was before the JSFR migration to its own blog. So I did a search on my other blog and lo. Coconut Pocky. I went and added the coconut Pocky to the proper JSFR so now it’s home with all the other reviews. On one hand, I’m kinda relieved that I’m not going crazy and/or visiting other reviewer’s heads. On the other hand, now I’m going to have to go through all the older entries to see if any other ones didn’t make the migration. Pain in my tukus. 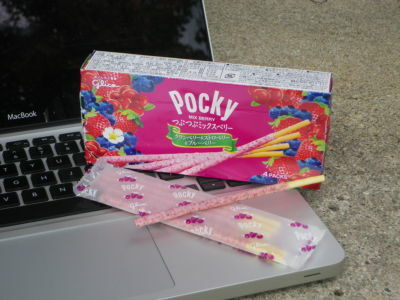 All’s well that ends well though, look – More Pocky! Here’s half the J-List 2010 order which arrived on my doorstep this afternoon. We’re currently munching on the Kim Chi Cheetos. None of the food drops have arrived yet but pictured in this batch is Sparkling Strawberry Kit Kats, Double Caramel flavored gum, Dragon Fruit Hi-Chew, Gorgonzola Cheeza, and two kinds of Cratz; Mexican Salsa Chicken and Smoky Cheese. Plus a couple more things that I can’t see right now because the pic is all HTML at the moment. Reviews start up again tomorrow! Happy New Year Junkies! The Review is going on a bit of a hiatus for the first part of January but fear not, I have plans! I’ve placed an order with J-List for lots of tasty wonderful snacks from the motherland so when they come in, the review will resume. For now, two months of double weekend posts tell me I should take a small break. 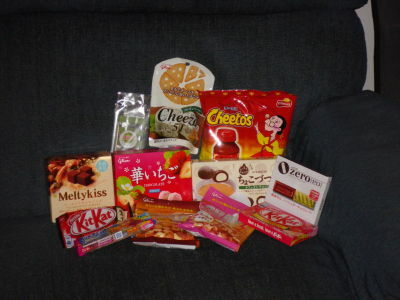 Meanwhile, check out the snack peeps listed on the side bar for a review fix. Until mid to late January!